In 2019, Paulson starred as Dr. Ellie Staple in the superhero thriller film Glass. She will next be seen in the drama film The Goldfinch, the animated adventure film Abominable, and the horror thriller film Run. In January 2019, it was announced that Paulson will star as Nurse Ratched in the upcoming Netflix drama series Ratched. ^ Blanchett, cate. "Sarah Paulson". Time. New York City: Meredith Corporation. Retrieved September 11, 2017. 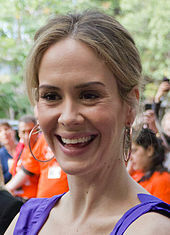 ^ a b "Sarah Paulson Biography". TV Guide. Retrieved September 9, 2018. ^ UPI Staff (December 17, 2017). "Famous birthdays for Dec. 17: Bill Pullman, Sarah Paulson". United Press International. Retrieved August 30, 2018. ^ "Full text of "Record of the Hampden-Sydney Alumni Association"". Hampden-Sydney College of Virginia. Retrieved August 30, 2018 – via Internet Archive. ^ a b c Persaud, Babita (March 28, 2002). "A big leap from Tampa". St. Petersburg Times. Retrieved February 6, 2014. ^ a b c "Swimmers - Cast - Sarah Paulson". Theatre Fire Films. Retrieved September 9, 2018. ^ a b c Schulman, Michael (March 2, 2016). "Sarah Paulson Opens Up About Acting, Marcia Clark and Dating Older Women". The New York Times. Retrieved September 9, 2018. ^ "A Conversation with Actor: Sarah Paulson". Broadway World. February 4, 2013. Retrieved December 14, 2013. ^ Yant, Monica (January 3, 1996). "'Gothic' door to stardom opens Series: CONNECTIONS". Tampa Bay Times. Retrieved January 13, 2014. ^ McCarthy, John P. (March 30, 1995). "CBS Sunday Movie: 'Friends at Last'". Variety. Retrieved September 12, 2018. ^ Muir 2001, p. 404. ^ a b Klady, Leonard (April 20, 1997). "Levitation". Variety. Retrieved September 11, 2018. ^ Brantley, Ben (October 19, 1998). "THEATER REVIEW; Dysfunctional, to Say the Least". The New York Times. Retrieved August 20, 2018. ^ "Sarah Paulson – Movies and Biography". Yahoo! Movies. Retrieved January 17, 2014. ^ Schwarzbaum, Lisa (March 5, 1999). "The Other Sister". Entertainment Weekly. Retrieved September 10, 2018. ^ Feeney, Mary K. (May 12, 2000). "'Held Up' Doesn't Add Up". Hartford Courant. Retrieved July 29, 2018. ^ McCarthy, Todd (December 10, 2000). "What Women Want". Variety. Retrieved September 10, 2018. ^ Bianculli, David (March 4, 2005). "There's No Deadwood in this Cast". New York Daily News. Retrieved September 10, 2018. ^ Phipps, Keith (May 13, 2003). "Down With Love". The A.V. Club. Retrieved September 12, 2018. ^ Erickson 2010, pp. 74–75. ^ a b Brantley, Ben (March 23, 2005). "A 'Menagerie' Full of Stars, Silhouettes and Weird Sounds". The New York Times. Retrieved September 10, 2018. ^ a b Rooney, Dave (September 28, 2005). "Colder Than Here". Variety. Retrieved September 10, 2018. ^ MTV Staff (September 16, 2013). "One 'Serenity' Actor is Looking for Another Gig with Joss Whedon". MTV. Retrieved August 30, 2018. ^ Dyer, James (September 2007). "Sarah Paulson Full Of The Spirit". Empire. Retrieved December 19, 2017. ^ Bierly, Mandy (March 31, 2009). "'Cupid' stars Bobby Cannavale and Sarah Paulson take the EW Pop Culture Personality Test". Entertainment Weekly. Retrieved September 12, 2018. ^ Kimball, Trevor (May 19, 2009). "Cupid canceled". TV Series Finale. Retrieved September 8, 2018. ^ Ausiello, Michael (January 20, 2010). "Exclusive: 'Grey's Anatomy' recasts Richard and Ellis!". Entertainment Weekly. New York City: Meredith Corporation. Retrieved January 13, 2014. ^ Boucher, Ashley (April 26, 2018). "'Grey's Anatomy': Elizabeth Moss, Sarah Paulson and 9 More Stars You Forgot Appeared on the Show". San Francisco Chronicle. Retrieved September 9, 2018 – via SFGate. ^ Isherwood, Charles (April 28, 2010). "A Literary Life Can Turn Lonely When the Cheering Stops". The New York Times. Retrieved September 12, 2018. ^ a b Lane, Anthony (October 24, 2011). "Family Farm". The New Yorker. Retrieved September 9, 2018. ^ Gennis, Sadie (December 9, 2015). "American Horror Story's Sarah Paulson Reprising Murder House Role in Hotel Finale". TV Guide. Retrieved September 9, 2018. ^ Goldberg, Lesley (June 11, 2013). "Emmys: Sarah Paulson on the Tortures of Being on 'American Horror Story'". The Hollywood Reporter. Retrieved September 9, 2018. ^ Debruge, Peter (May 28, 2012). "Mud". Variety. Retrieved September 8, 2018. ^ Markovitz, Adam (March 7, 2013). "Talley's Folly". Entertainment Weekly. Retrieved September 9, 2018. ^ Ayers, Mike (October 16, 2013). "Sarah Paulson: 'American Horror Story' Is Too Scary for Me". Rolling Stone. ^ Rocchi, James (December 12, 2013). "Sarah Paulson channels many nasty emotions for '12 Years a Slave'". Los Angeles Times. Retrieved September 9, 2018. ^ Collin, Robbie (June 3, 2016). "12 Years A Slave, review: 'This, at last, really is history written with lightning'". The Telegraph. London. Retrieved September 9, 2018. ^ Goldberg, Lesley (October 8, 2014). "'American Horror Story's' Ryan Murphy Explains How Sarah Paulson Plays Conjoined Twins". The Hollywood Reporter. Retrieved September 9, 2018. ^ Birnbaum, Debra (October 14, 2015). "'American Horror Story's' Sarah Paulson on That Fall, Lady Gaga and Sally's True Addiction". Variety. Retrieved December 2, 2015. ^ Archer, Stephanie (July 25, 2018). "Sarah Paulson Clarifies Dual Characters in American Horror Story: Apocalypse". Screen Rant. Retrieved September 9, 2018. ^ Truitt, Brian (November 20, 2015). "Review: 'Carol' is an acting masterclass". USA Today. Retrieved August 30, 2018. ^ Goldberg, Lesley (December 9, 2014). "Cuba Gooding Jr., Sarah Paulson to Star in FX's 'American Crime Story: People v. O.J. Simpson'". The Hollywood Reporter. Retrieved January 12, 2015. ^ Yee, Lawrence (January 8, 2017). "Sarah Paulson Wins Golden Globe for Best Actress in a Limited Series or TV Movie for 'The People v. O.J. Simpson'". Variety. Retrieved September 9, 2018. ^ Gennis, Sadie (September 26, 2016). "The True Star of American Horror Story: Roanoke Is Sarah Paulson's Hair". TV Guide. Retrieved September 9, 2018. ^ Birnbaum, Debra (October 31, 2016). "'American Horror Story' Crossover: 'Asylum's' Lana Winters to Appear on 'Roanoke'". Variety. Retrieved September 9, 2018. ^ Hayman, Amanda (July 24, 2017). "American Horror Story: Cult Artwork Reveals Season 7 'Love Story'". Screen Rant. Retrieved August 1, 2017. ^ Petski, Denise (August 23, 2016). "Sarah Paulson Will Play Geraldine Page In Ryan Murphy's Feud For FX". Deadline.com. Retrieved February 28, 2017. ^ Snierson, Dan. "Sarah Paulson joins Ryan Murphy's Feud". Entertainment Weekly. Retrieved September 14, 2016. ^ Stolworthy, Jacob (June 6, 2018). "Ocean's 8: What the critics are saying about all-female reboot". The Independent. Retrieved June 6, 2018. ^ "Ocean's 8 (2018)". Box Office Mojo. Retrieved September 10, 2018. ^ a b Turchiano, Danielle (August 3, 2018). "Sarah Paulson and Evan Peters to Direct 'American Horror Story: Apocalypse'". Variety. Retrieved September 12, 2018. ^ Allen, Jane E. (June 25, 2002). "Skin Cancer Cases On The Rise Among Teens, Young Adults". Orlando Sentinel. Orlando, Florida: Tronc. Retrieved September 10, 2018. ^ "Cherry Jones, Sarah Paulson Split". Us Weekly. Retrieved October 9, 2009. ^ "Talley's Folly Star Sarah Paulson on Not Starring in Annie, Not Playing Kristin Chenoweth and Not 'Boffing' Jessica Lange". broadwayworld.com. Key Brand Entertainment. March 22, 2013. Retrieved January 13, 2014. ^ Wilkins, Vanessa (March 2, 2016). "Taylor and Paulson in relationship since early 2015". abcnews.go.com. Retrieved September 10, 2018. ^ Griffith, Carson (April 27, 2017). "Sarah Paulson Was Shocked To Find This Buried In The Yard Of Her New House". Architectural Digest. Retrieved September 9, 2018.